Now that AMD’s full set of 7 series GPUs is out in the wild we decided to take a look and see what availability was like. To get an overview of the supply situation for online retailers we checked in at Newegg.com and Amazon.com, as well as a few others to verify our findings. Please note that thing do change quickly in the online retail world, and as always what we’re really trying to do here is look for general trends, as opposed to single SKUs or products. Starting with the fastest single GPU in the world (not for long), the HD 7970, we found that of the 16 listed HD 7970 SKUs only six of them were actually in stock. Of the 11 SKUs listed on Amazon.com one was completely out of stock and four had 15 or less units in stock. So there appears to be a shortage of HD 7970’s at the moment, which might have something to do with this. As far as pricing goes most HD 7970 SKUs seem to be at or hovering a bit above AMD’s $549 MSRP. Most of the overclocked models are being priced just below $700, and of course PowerColor’s LCS (read: water-cooled) model comes in as the most expensive HD 7970 on the market at a cool $799. Moving down the stack we have the HD 7950. Of the ten SKUs listed on Newegg, four are out of stock. Moving over to Amazon.com we see that of the 11 SKUs listed six of them have warnings about low stock. Most of the available SKUs are sitting at the $469 price point; there are still a few at $449, the original MSRP. It should be noted that one of the reasons there seem to be so many SKUs at the $469 price point is in part due to the non-reference nature of the HD 7950 line. Most of those SKUs are clocked somewhere above the 800Mhz core clock specification that came from AMD, often at 830Mhz or even 900Mhz. Pricing is far more stable on Newegg compared to Amazon which had a reseller that wanted just under $1300 for an HIS branded SKU. On to the HD 7870, this is the most recently launched part in the 7 series. As you might expect this means that it has the fewest number of SKUs in the channel. On Newegg there are four SKUs, two of which are out of stock. A quick search on Amazon turned up six SKUs of which three are out of stock, and the rest have fewer than ten units in stock. When AMD paper launched the 7800 series two weeks ago they promised that there would be general availability by today. It looks like what we have today is a little bit less than what general availability meant for the rest of the 7 series. The HD 7850 has pretty much the same story as its more senior sibling. Of the five SKUs listed on Newegg only two were out of stock. Amazon also lists four SKUs, of which two of which are out of stock, and the remainder have fewer than ten cards in stock. So HD 7850s and HD 7870s are available, but practically speaking both the HD 7870 and the HD 7850 are in short supply, due both to a lack of stock and SKUs. Moving yet again down the stack we have the HD 7770. All but one of the 11 SKUs on Newegg are in stock. So availability on this part seems rather good really. Overclocked models are selling for as high as $179 which is not that far off of the $159 price point that most of the SKUs are sitting at. Amazon has ten SKUs in stock of which two had less than four units left in stock. As a general statement it’s safe to say that the HD 7770 seems to have better availability than the rest of the 7 series. The HD 7750 appears to be less available than its faster sibling. Of the seven SKUs on Newegg three are out of stock. Prices are saying pretty steady at the parts MSRP of $109; a single passively cooled model from Sapphire is priced at $125. Over at Amazon three of the six listed SKUs were out of stock. Availability is significantly tighter for the HD 7750 than the HD 7770. Part of this is probably due to the un-competitiveness of the HD 7770 which, when compared to the GTX 560 or the HD 6870, offers less performance at a similar price. So now that we’ve gone through the current availability of each individual part in the 7 series, let look at the availability picture from a more general perspective. This chart is a contains my findings from both Newegg and Amazon, and the takeaway here is that availability is rather limited for the 7 series. 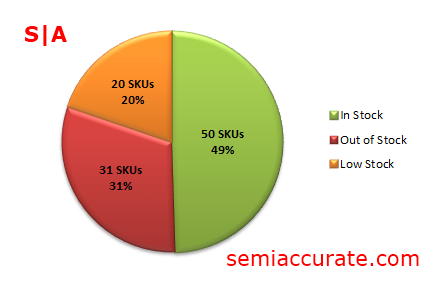 30 percent of SKUs are out of stock, a further 20 percent are in are in low supply, and only half of the SKUs on the market are properly stocked. 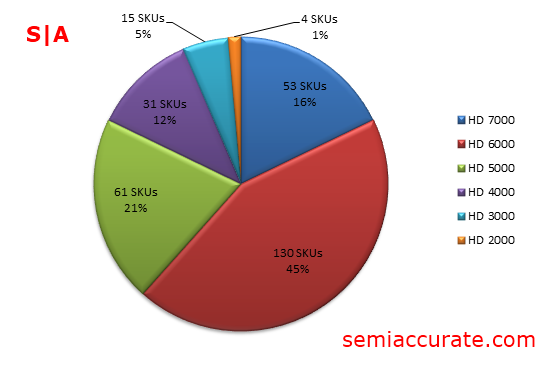 With that in mind let’s zoom out even further to a breakdown of AMD SKUs by family.